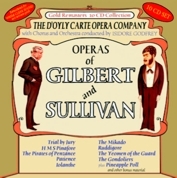 AVID Entertainment are pleased to present one of our finest productions yet with the release of "The Operas Of Gilbert and Sullivan"
This superbly re-mastered 10 x CD Box Set contains nine operas recorded between 1949 - 1951, recorded under the direction of and supervised by Bridget D'Oyly Carte and conducted by Isidore Godfrey. In addition we also include the wonderful ballet Pineapple Poll, arranged by a young Charles Mackerras and set exclusively to the music of Sir Arthur Sullivan. To complete our Box Set, on CD10 we have also included extra bonus material in the shape of two orchestral selections from "HMS Pinafore" and "The Yeomen Of The Guard" and the "Overture Di Ballo"
We are confident that the many hours of studio time taken in the re-mastering of these historic recordings has produced the best sound that they have ever been heard in! To enable us to offer this wonderful music at an economical price we have filled each CD to capacity and contained all nine operas across just 10 CD's! Each CD has been packaged in an attractively designed slip case complete with track listings and running times and the complete set is housed in an attractive CD size "lift off lid" box, together with full notes on the stories of all the operas!